The 2007 event is scheduled for Saturday, October 27, 2007. Festival-goers board the JR Yamanote Line at JR Shinjuku station, platform 13 (Yamanote bound for Ikebukuro). Japanese citizens as well as foreigners meet where car 10 stops, in front of the escalator from South exit. Everyone boards the 21:08 northbound train and loops around clockwise. Frequently everyone brings their own alcoholic beverages. 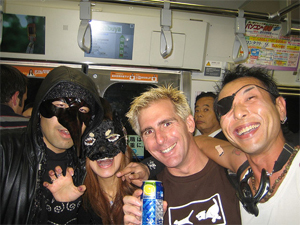 Another interesting item of note is the can the dude is holding, a drink called Chūhai (チューハイ or 酎ハイ), which I will elaborate on more. In the meantime, get your costume together and get ready for some ugly foreigners to be cramped into one train while drunk. Sounds like fun.